CASE compact wheel loaders offer Versa-Boom linkage for excellent reach, visibility and precise parallel lift. Get greater material retention with increased bucket roll back. A comfortable cab keeps you in the seat longer. For fast daily checks, you have easy access to service points at ground level. These machines are ideal for landscaping, industrial material handling and residential construction applications. CASE equipment features the advanced in-house engine technology developed by sister company FPT Industrial that pioneered low emissions, high efficiency solutions for on- and off-road applications. With a broad portfolio of technologies and products, FPT brings to CASE customers the competitive advantage of powertrain technologies that reliably delivers high performance with low operating costs – proven technologies from a global engine manufacturer that produces as many as 600,000 engines a year. The combination of the articulated joint and the rear oscillating axle reduces maximum cab oscillation by 50% or more. It progressively disengages the transmission during the decelerating phase and progressively engages the brakes. You can always take the shortest path from point A to point B - in indoor jobs or when transporting on a truck. The superior hinge pin height and the CASE “banana“ arms make it easy to load at the centre of the trailer without touching the edge with the arms. See how your favorite CASE Loaders compare. Configure your perfect CASE Loaders today. 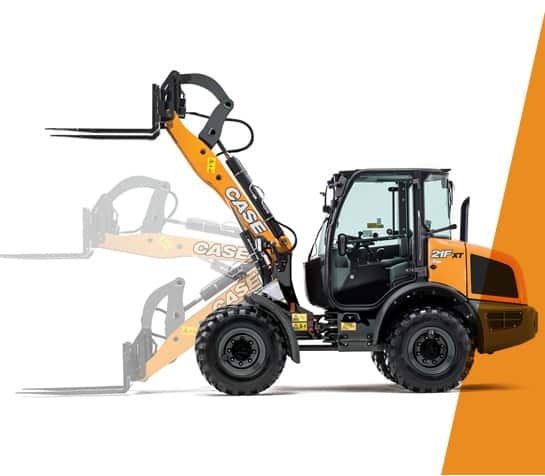 Download CASE Loaders brochure now!